Apple is rumored to replace iPhone's Touch ID home button with alternative bio-recognition hardware when it launches an OLED version of the handset later this year, but the technology enabling that transition is so far an unknown. A patent application published Thursday, however, indicates where the company's research is headed. In its filing for "Acoustic imaging system architecture," Apple proposes a method by which a conventional capacitive fingerprint sensor like Touch ID might be replaced by an array of acoustic transducers laid out beneath a device display or its protective housing. As described in some embodiments, the transducers in a first mode generate acoustic waves, or pulses, capable of propagating through a variety of substrates, including an iPhone's coverglass. Operation, or driving, of the transducers is managed by a controller. The same transducer hardware then enters a second sensing mode to monitor reflections, attenuations, and diffractions to the acoustic waves caused by a foreign object in contact with the input-responsive substrate. Resulting scan data in the form of electrical signals is read by an onboard image resolver, which creates an approximated two-dimensional map. 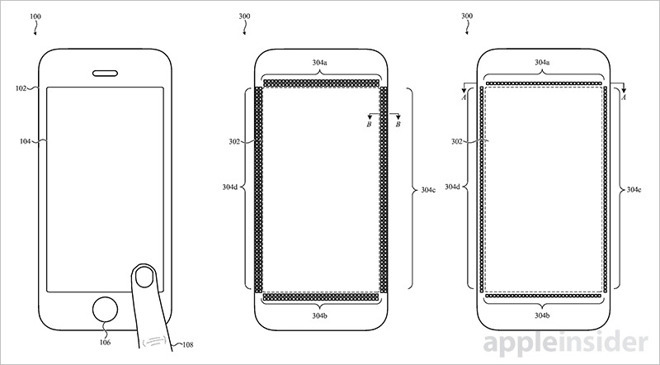 Applied to biometric recognition solutions, Apple's acoustic imaging system might be configured to read a user's fingerprint. According to the filing, ridges in a finger pad introduce an acoustic impedance mismatch that causes the mechanical waves generated by a transducer to reflect or diffract in a known manner. Thanks to its design, the acoustic system can be installed practically anywhere in a device chassis, including directly under a display. Other potential points of integration include a screen's perimeter or bezel, around buttons and in non-input areas of a housing, like a rear chassis. The latter coupling method would allow an example system to sample a user's entire handprint. Indeed, in some cases the system might be configured to scan for particular body parts like a user's ear or a skin pattern in order to determine how the device is being held. Depending on the implementation, an acoustic imaging system might also serve as a robust replacement for other legacy components like an iPhone's proximity sensors. The patent application goes on to cover system details like ideal materials, transducer placement, controllers, drive chips, component layouts and more. Whether Apple plans to incorporate acoustic imaging technology in this year's "iPhone 8" is unknown. Noted KGI analyst Ming-Chi Kuo predicts the company will ditch existing Touch ID technology in favor of a dual — or perhaps two-step — bio-recognition solution utilizing an optical fingerprint reader and facial recognition hardware. Kuo further elaborated on Apple's face-recognizing technology in a note to investors this week, saying Apple plans to incorporate a "revolutionary" front-facing camera that integrates infrared emitters and receivers to enable 3D sensing and modeling. Apple's acoustic imaging patent application was first filed for in August 2016 and credits Mohammad Yeke Yazandoost,Giovanni Gozzini, Brian Michael King, Marcus Yip, Marduke Yousefpor, Ehsan Khajeh and Aaron Tucker as its inventors.